BETHLEHEM, Pa. (April 24, 2016) – Bethlehem Steel FC tied Charleston Battery 0-0 Sunday afternoon at Goodman Stadium. Steel FC now have a record of 2-2-1 in their 2016 inaugural season and are tied for fifth place on points in the Eastern Conference. Both teams had promising scoring chances in the first half. In the 12th minute, Derrick Jones fired a shot from the top of the 18 yard box that went over the crossbar. In the 36th minute, Charleston’s Ataullah Guerra sent a powerful shot at John McCarthy’s goal but it narrowly missed the target and went wide of the far post. Just before halftime, Walter Restrepo crossed the ball to Eric Ayuk and the young midfielder made contact with the ball only for it to go wide of Odisnel Cooper’s net. Bethlehem Steel FC created several chances in the second half. In the 61st minute, Ryan Richter headed the ball at the goal but the Battery defense cleared it. Shortly after in the 65th minute, Restrepo played a beautiful through ball to Fabian Herbers, but Cooper saved Herbers’ shot. At the final whistle, the score remained 0-0. Steel FC (2-2-1) return to action on Sunday, May 1 when they face Louisville City FC at 3 p.m. at Goodman Stadium. It will be the third of three consecutive home games and will be broadcast on Service Electric TV2. Single game and group tickets are available by visiting philadelphiaunion.com/steelfc/tickets or by calling 844-STEELFC. Jaiem Herrera (Center), Brandon Smith (Assistant), Dustin Killick (Assistant), Jaroslaw Werel (Fourth). 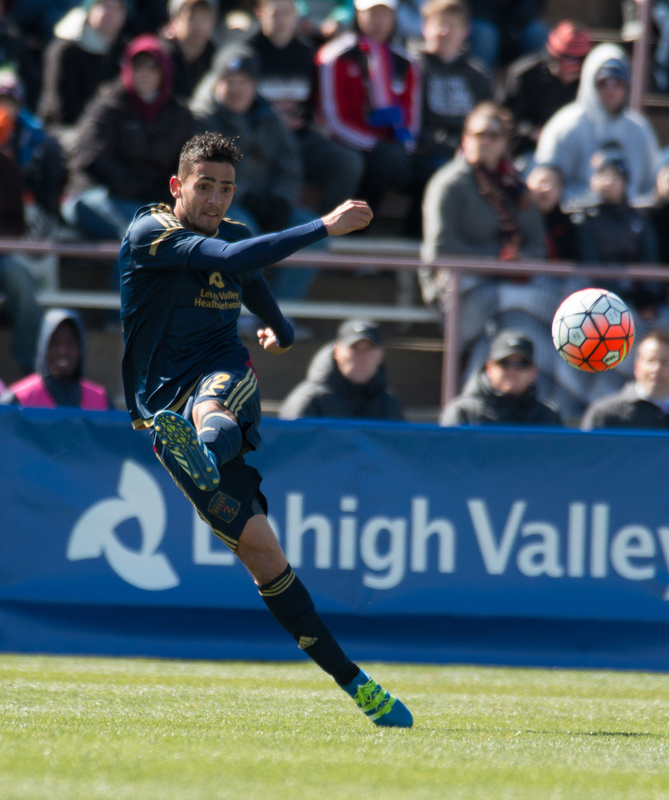 Bethlehem Steel FC now have a record of 2-2-1 in their inaugural 2016 season. I did expect them to sit in the way they did and just try to counter for 90 minutes and they did a good job of it they were two ranks of four and they played two forwards one on top of the other, two strong kids who gave us some trouble getting the ball back down and into their end quickly. So I think they accomplished what they wanted too, and for the most part, we never felt too much danger outside of the set pieces that they were given a number of. I think we have a snapshot now of what our season should look like. We’ve played some of the top teams in the East and I am happy. I am happy with where we are at and I think our relationships are continuing to develop with these guys. That was our fifth different starting 11 so those relationships are going to take longer to grow in our team then they do in others and that’s fine. We are patient and we’ll stick to the task at hand. I think the group of four as a whole did really well. I think Auston and Anderson in particular did a good job in matching the physicality. He is very good at initiating contact and being a handful in that way and I think those guys met the challenge well. Well, not really we get to train with them every so often. The guys that come down I train with all the time so it doesn’t bother me too much and I think the team has dealt with it very well. Some of us come down and train when we are not on the 18, so we get at least a day or two training with the Steel, so it’s good. I think it’s just proving myself as a starter and just being really consistent. That’s my goal to just try and be as consistent as possible and anytime you can go out in a game and start it’ll help me in the long run because I am pretty young for a goalkeeper I think. We watched some tape. We saw he gets behind and they like to play direct to him. I thought he did a decent job of making his runs and made it tough for our defenders. He got a lot of fouls but I think our defense has to do well with him I think he got behind once and we dealt with it besides that I thought it was a good day for my defense. Yeah, I mean as a defender it’s don’t concede first, but at home we want to take three points you know, it’s that simple. It’s a result but obviously we wish we could have came by with three. I mean with something like this it’s 75-80 degrees today, imagine in the summer, the field just tends to get stretched like that. The guys have some heavy legs and I can only imagine it will happen later in the season as it gets 95-100 degrees out here. That’s just the way it tends to go. You try to keep it together as much as possible but you know you can see both teams, the distance between the players gets bigger and bigger by the game. Absolutely, you saw our last three home games, three pretty good teams from our side of the USL and we went 2-1 loss, 2-1 win and 0-0 draw and I think when it’s this competitive and this tight the league, the results are going to reflect that so. Like I said, we are happy to get the point today but it could have been more. You’ve got to tip your hat to the guys who come because they have been very professional, every game, it’s something that is tough on a lot of players, and a lot of Bethlehem guys, but as long as we are professional about it and know we are out here on the same pitch to achieve the same goals then it tends to work. Obviously I thought the back line, we worked well together today, even though it was my first time playing with Anderson, I thought he was an easy player to play with because he was very professional about it and I thought he did alright today. Bethlehem Steel FC have scored a whopping two goals in the three United Soccer League games when they have had no less than SEVEN players under Major League Soccer contract to the Philadelphia Union in their line-up — so, in other words, exactly how much precious “player development” can really be going on with BSFC anyway, at least offensively speaking? Soccer is supposed to be far more popular than it ever was during the late 1970s and early 1980s (back when the American Soccer League champion Pennsylvania Stoners played at J. Birney Crum Stadium in Allentown) — why are BSFC failing to draw even three thousand people here now in the 21st Century? I have questions – WHO has answers?